Do you have a partner that eats a lot, or growing boys that tend to ‘eat you out of house and home’? With the need to cut down on expenses where ever possible and men or growing boys to feed it can feel like your grocery bill is the one place that it is impossible to cut down. 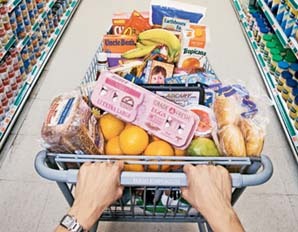 There are a lot of different ways that you can save on your monthly grocery bill, the article on Reddit lists tried and tested methods from various subscribers, and here are some tips which do work to save on your groceries. Cook meals yourself, the prepackaged meals are convenient but much more expensive. Plan your shopping around the sales, soon you will notice that items go on sale at regular intervals, so making use of the sales is cheaper than paying full price. Don’t be tempted to only buy name brands, if the generic is cheaper then buy the generic, the difference in taste is often so small that you do not even realize it. For more great ideas on how to prepare meals for less, check out the article on Reddit.